Calculator & Measurement Unit Converter. 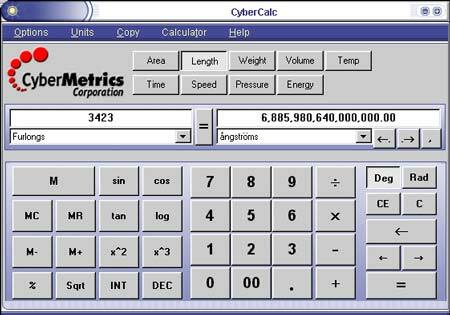 This free utility is much more than a calculator�it automatically converts values expressed in one unit of measure (of area, length, weight, volume, temperature, time, speed, pressure and energy) to equivalent values in another. Supports "Skins" for a completely customized look. Several skin themes are included (Metal, Aqua, Military, Techno and others). Converts in both directions numerical values expressed by means of various physical units. There are 733 units, divided in 37 groups including the old Bohemian units. It has 20 catagories with 14,000 possible combinations, a periodic chart, physical constants and much more. Shareware. A four-way calculator that can operate in a standard or RPN entry mode. Scientific: logarithmic and trigonometric functions; Complex: complex number mathematics; Financial: statistic and interest rate calculations; Conversions: from one unit measure to another. download un (11K) --- a units conversion program for UNIX systems by Gregory R. Simpson. From Jason Williams (35k). Requires VB runtime libraries. Converts one measurement unit to another. NEW-Process thousands of values at a time. Powerful scientific precision. 1700 conversion factors included. Add your own. "Spell Out" result. "Thirty six point one feet is equivalent to eleven point zero meters". Works like Windows Help Find.